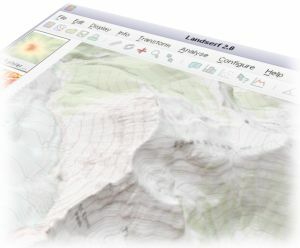 Handles multiple surface models - raster digital elevation models (DEMs), vector Triangulated Irregular Networks (TINs), contours and metric surface networks (MSNs). Interactive 3D viewing and 'flythrough' of surfaces on platforms that support OpenGL. A range of powerful and interactive visualisation techniques including lighting/shade models, multiple image blending and dynamic graphical query. Raster and vector transformation including image rectification and map projection. Multi-scale surface processing based on quadratic regression. Fractal and polynomial surface generation for modelling and simulation. Multi-scale parameter and feature extraction (slope, aspect, curvature etc.). Import and export of common raster and vector formats. Integration with Garmin GPS receivers. Latest release: LandSerf 2.3. If you really need to, you can download previous versions. The LandSerf Manual is now available. 214 pages containing all of the LandSerf documentation in one handy searchable and printable book. LandSerf 2.3 released. See the new features in LandSerf 2.3 since the previous version. LandSerf downloads reach 40,000 and are maintaining an average of over 1200 per month. LandSerf 2.3 Preview to be launched at Vis/InfoVis 2007, Sacremento, California. Preview copies will be used in the tutorial GeoVisualization with Google Earth and GIS. LandSerf downloads reach 20,000 and are maintaining an average of over 1000 per month. LandSerf downloads reach 12,000 and are currently averaging about 1000 per month. Users from 122 countries around the world have tried the software since it was first released. See the 'Who uses LandSerf' page for more details. LandSerf 2.2 released! The latest version of LandSerf with new functionality and performance improvements is now available for download. Existing LandSerf users may wish to view the changes since the previous version. Image gallery showing example LandSerf output released. If anyone would like to contribute their own LandSerf images to this gallery, please email to the address at the bottom of this page. New chapters added to the programming guide covering vector map manipulation and dealing with processing classes. LandSerf wins GISRUK 2004 'Visualisation Challenge'. Competing against GIS researchers and developers of commercial graphics and visualisation systems, LandSerf analysis and 3d flythough is voted winner of the GIS Research UK Visualisation Challenge. See the GISRUK 2004 web site for more details.